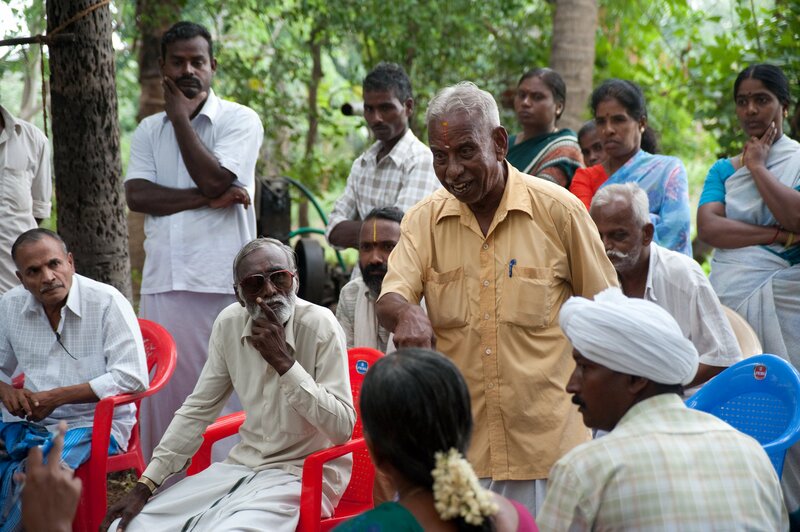 Thanks to the ClimaAdapt project, 90,000 Indian smallholders now have access to extensive knowledge on how they can adapt their agricultural practise to a changing climate. Countries in the tropics and sub-tropics are particularly vulnerable to climate change, as extreme weather conditions pose a serious threat to their food security. In India, droughts and damaging floods are continuously affecting the well-being of a growing population, of which the vast majority reside in rural areas and are highly dependent on natural resources for their food, shelter and income. Climate change with its extreme weather conditions poses a serious threat to the global food security, especially those who live in rural areas and are highly dependent on natural resources. Photo: Ragnar Våga Pedersen. To address these issues and find solutions to climate-related challenges for Indian agriculture, ClimaAdapt, an interdisciplinary and integrated research project, was initiated in Andhra Pradesh, Telangana and Tamil Nadu states in 2012. The project had its final meeting in May 2017. 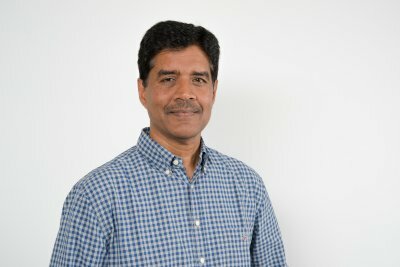 ClimaAdapt’s coordinator, Dr Udaya Sekhar Nagothu from the Norwegian Institute of Bioeconomy Research, NIBIO, explains that active participation and continuous dissemination of research results and other information between researchers, policy makers and stakeholders, has been essential in the project. 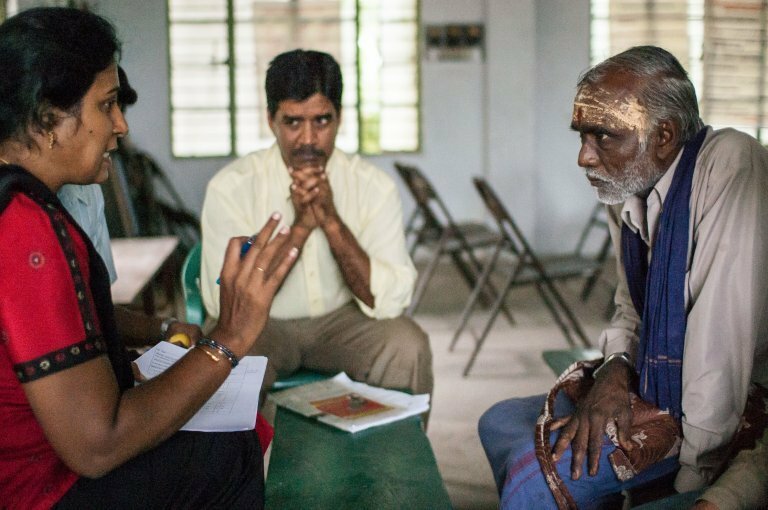 “The link between science, stakeholders and policy makers, has been key to ClimaAdapt’s success,” says project coordinator Dr Udaya Sekhar Nagothu from NIBIO, here seen in discussion with a small scale farmer (right) and Dr V. Gheeta Lakshmi from the Tamil Nadu Agricultural University. Photo: Ragnar Våga Pedersen. “Climate change is a complex issue and different disciplines and people have had to simultaneously interact and work together, and not least, communicate with each other. This link between science, stakeholders and policy, has been key to ClimaAdapt’s success.” Dr Nagothu says. “In the past five years we have developed climate-smart rice growing and irrigation technologies and improved the adaptive capacity of farmers and selected agriculture and water sectors through various measures. Together, we have ensured that the food security and livelihood of 90,000 Indian smallholders, one third of these women, has been vastly improved,” he adds. 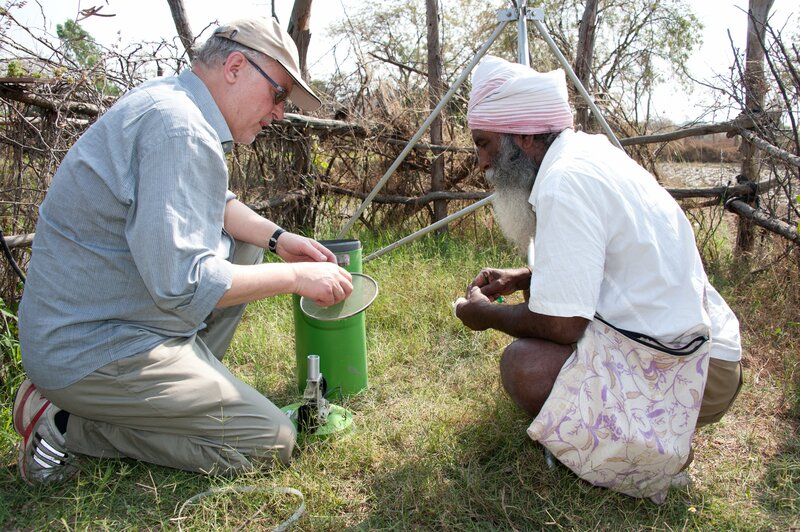 Dr Johannes Deelstra from NIBIO (left) with a local farmer. Photo: Ragnar Våga Pedersen. The main outcomes of ClimaAdapt include farmer driven testing, refining, upscaling and finally, the implementation of several new rice growing and irrigation technologies as well as seed varieties. This has contributed to a reduction in water use by 40 percent and a 25 percent yield increase. Eight Village Knowledge Centres have been established in the project, providing close to 25,000 local farmers with good and relevant information and training on farming and climate adaptation. An additional 65,000 farmers have benefited from this, gaining access to information through farmer-to-farmer communication and exchange of knowledge processes. ClimaAdapt has also resulted in the establishment of three climate cells, as well as three stakeholder advisory centres. Norway’s Minister of Agriculture and Food, Jon Georg Dale, visited India and the project areas in February 2017. He says he is impressed by the complexity and scale of the ClimaAdapt project, in which thousands of farmers, several NGO’s, scientists and government officials have worked towards a common goal of securing food production for the future. “In my opinion ClimaAdapt is an excellent example of how we can contribute to food security and sustainable development in a changing climate,” Dale says. “The project puts the farmer in the centre which is important, not least to recognize the role of farmers, all over the world, in feeding the people and farmer’s contribution to global food security”. NIBIO’s Director General, Nils Vagstad, agrees. “ClimaAdapt has been particularly successful in that the project’s main focus has been the farmer. 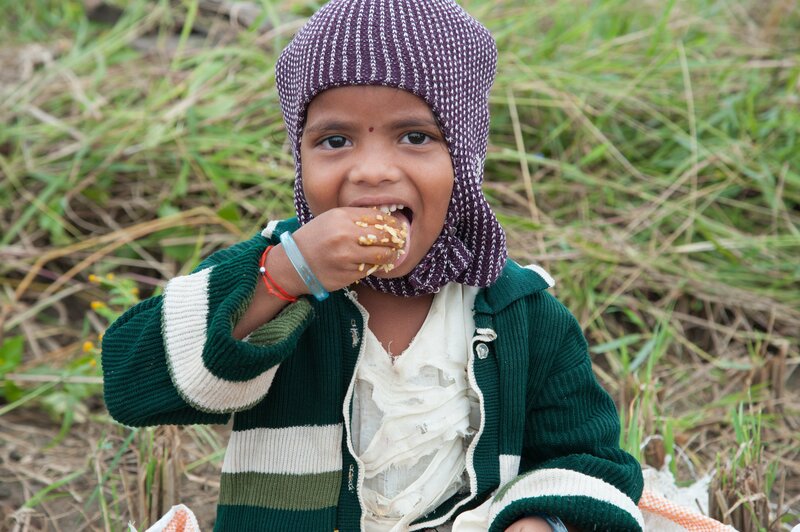 By helping smallholders adapt their agricultural practice to a changing climate, we can contribute to food security for a growing population - not only in India, but also on a global scale,” he says. 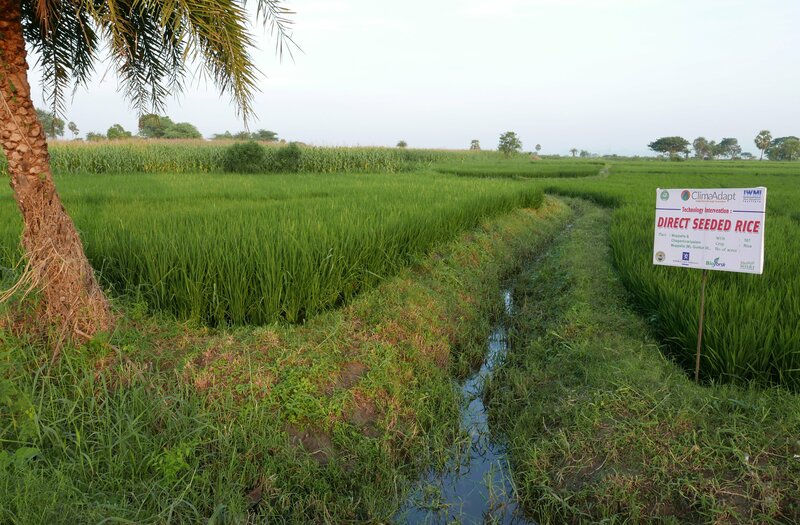 In ClimaAdapt, three different rice growing and irrigation methods have been tested, upscaled and implemented. These are SRI, or system of rice intensification, alternate wetting and drying, and direct sowing of rice. All work towards reducing the amount of water used on the rice crops while at the same time increasing the yield. New rice growing and irrigation technologies, such as direct sowing of rice along with alternate wetting and drying and system of rice intensification, have resulted in a 40 percent water use reduction and a yield increase of 25 percent. Photo: Ragnar Våga Pedersen. “SRI is one of the main technologies we’ve promoted because we discovered that by modifying the cultivation system from the traditional one, which is more of a flood based irrigation system, this technology can contribute to a 20-25 percent reduction in water usage,” says Professor V. Gheeta Lakshmi from the Tamil Nadu Agricultural University. She adds that the alternate wetting and drying method has proven advantageous for the nutrient uptake of the crops, as well as other biochemical reactions in the soil. This results in higher yields. Dr Johannes Deelstra from the Norwegian Institute of Bioeconomy Research confirms this, and says their measurements show that the new rice growing alternatives introduced by ClimaAdapt result in an increase in yield and a reduction in water use. “This leads to an improved water use efficiency – which basically means more crop per drop,” he says. The implementation of these new rice growing and irrigation technologies, would not have been successful unless they were made known to and acknowledged by Indian policy makers. “One thing is the production of scientific results, but if these weren’t communicated to policy makers at an early stage, we would have failed to disseminate them and put them into policy guidelines. Science and policy linkage has been crucial in ClimaAdapt,” Dr Nagothu says. Disseminating project results to policy makers has been an important part throughout the ClimaAdapt project period. Here from a national workshop in Hyderabad in November 2014- Photo: Ragnar Våga Pedersen. As well as linking science and policy, ClimaAdapt has strongly emphasised the importance of stakeholder involvement. 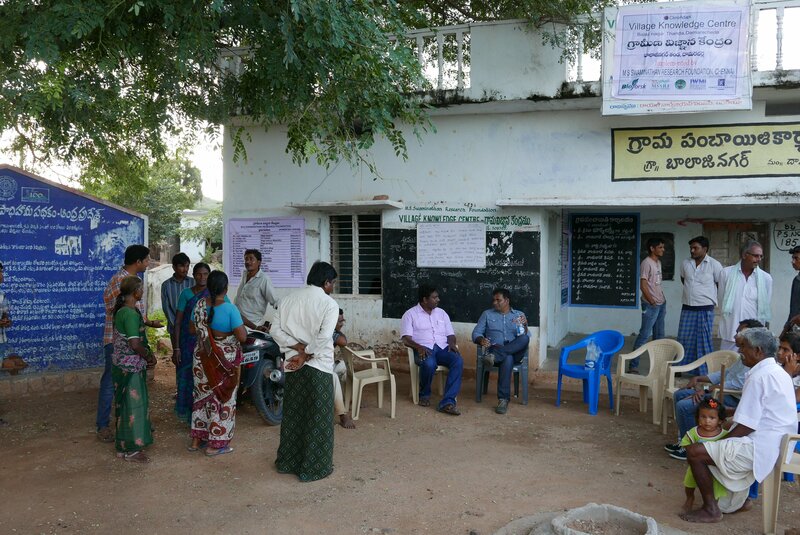 Already at an early stage, Village Knowledge Centres were set up as an integrated part of the project. The centres, of which there now are eight, focus on climate awareness, training and capacity building of small-scale farmers at a local level. Eight Village Knowledge Centres have been set up during the project period of five years and focus on climate awareness, training and capacity building of small-scale farmers at a local level. Photo: Ragnar Våga Pedersen. Sharing information through local knowledge hubs such as these, and making use of various digital platforms, has proved to be an efficient way of transferring knowledge on climate adaptation practices and agricultural expertise to rural communities. This has been important in a country where conventional methods of agricultural extension services and knowledge transfer methods have not always addressed the specific problems of farmers and their local challenges in a sufficient way. In recent years, however, India has seen a shift toward a more demand-driven agricultural extension service with the use of new information and communication technologies. The Village Knowledge Centres have made use of this, and mobile services are now used to send out text messages several times a day to farmers in the participating villages. The messages include weather or market related information, or information linked to farming practices during the cropping season. The Village Knowledge Centres use internet and mobile services to provide farmers with information on how to best adapt their farming practise to the changing climate, as well as setting up meetings where farmers can get direct advise from the experts. Photo: Ragnar Våga Pedersen. “One main focus of ClimaAdapt has been to provide farmers with timely information on climate resilient crop technologies, farming practices that farmers need to take up during the course of a cropping season, soil management, planting, crop management, need-based fertiliser and pesticide application, harvesting and marketing”, says Dr Nagothu. “Our aim has been to link farmers together and provide need-based and correct information that help them adapt to climate change, as well as increase their yields and income. Thanks to new information and communication technologies such as internet services and mobile phones, we have been able to reach farmers faster and provide them with relevant information – even in the remotest of villages,” he adds. The Village Knowledge Centres also serve as a place where farmers can meet to discuss, not only with each other, but also with scientists, government agencies and other stakeholders. Photo: Ragnar Våga Pedersen. The Village Knowledge Centres also serve as an important platform for farmer interaction, not only with other farmers, but with scientists, government agencies and other stakeholders. The Centres have developed into extensive information hubs, both for agriculture, and for additional services within for example health, livestock research and social services. Now that the ClimaAdapt project has ended, the idea is that each village and the farmers themselves take hold of their centre and carry on the services it provides. The project partners have also encouraged the Indian government and private sector to scale up the centre model, so that larger areas can benefit from its services. 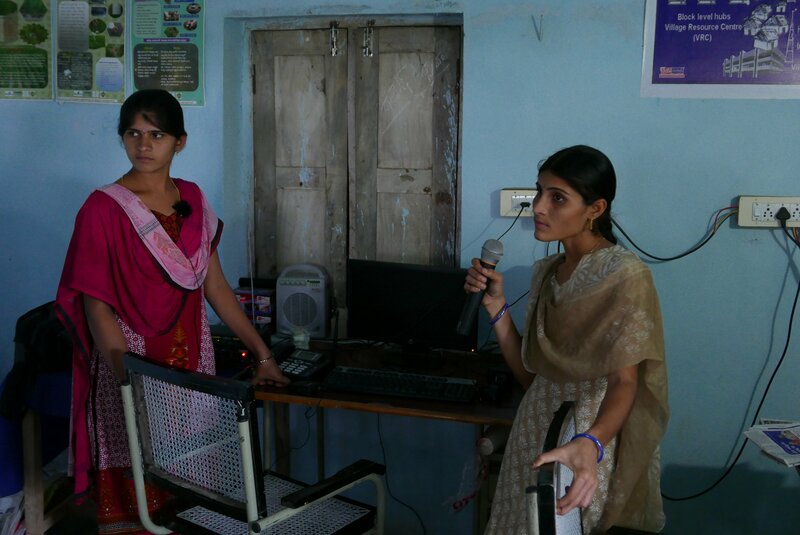 Two Knowledge Workers at a Village Knowledge Centre. Photo: Ragnar Våga Pedersen. “We have built a system at the community level, which is managed by the community itself, so that they are able to source knowledge from different areas. In connection with this we have trained locals to become what we call Knowledge Workers,” says Dr Nancy J. Anabel from the M.S. Swaminathan Research Foundation. Many of these Knowledge Workers are women, as women are often ignored in traditional agricultural extension systems in India. This is a problem seeing as they play an important role in India’s agricultural development, both as agricultural labourers and farmers. 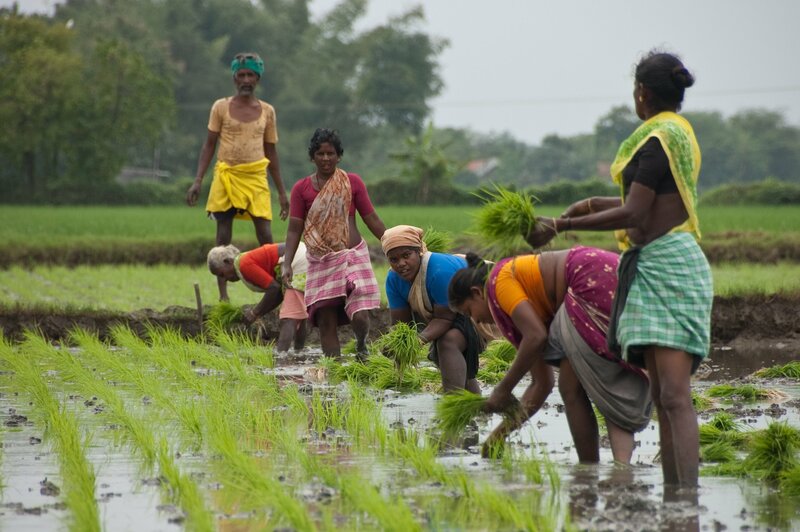 Women play an important role in India’s agricultural development, both as farmers and agricultural labourers, but are often not taken into account as far as decision making goes. By employing women at the Village Knowledge Centres, they are included in agricultural matters they otherwise may not have been a part of. Photo: Ragnar Våga Pedersen. “Traditionally, women are busy in the household and have not been able to meet extension workers. By hiring women as Knowledge Workers at the Village Knowledge Centres, women are included in a different way,” Dr Nagothu explains. “Gender has been an important component of ClimaAdapt, because of the role of females in agricultural in general, especially in India. Without the engagement of women, I don’t think any adaptation strategy or programme will succeed,” he says. On the 11th and 12th of May this year, ClimaAdapt held its final workshop in Chennai in Tamil Nadu, India. The international workshop brought together researchers, stakeholders and policy makers from all over India and abroad, among these Dr M.S. Swaminathan, UNESCO Chair in Ecotechnology and the founder of the M.S. Swaminathan Research Foundation in Chennai. 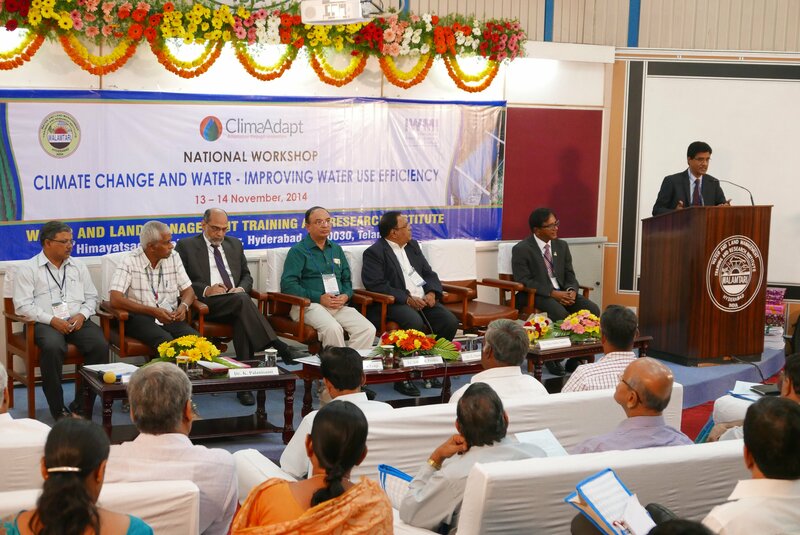 On the 11th and 12th of May this year, ClimaAdapt held its final workshop in Chennai in Tamil Nadu, India. The international workshop brought together 140 researchers, stakeholders and policy makers from all over India and abroad, among these Dr M.S. Swaminathan UNESCO Chair in Ecotechnology and the founder of the M.S. Swaminathan Research Foundation, one of the project partners in ClimaAdapt. 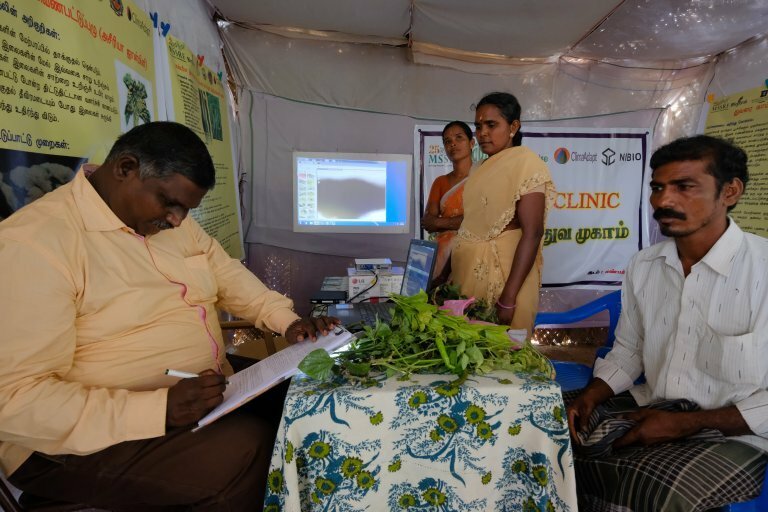 He is depicted here with Dr V. Gheeta Lakshmi (left) from the Tamil Nadu Agricultural University and ClimaAdapt’s project coordinator Dr Udaya Sekhar Nagothu (right) from the Norwegian Institute of Bioeconomy Research, NIBIO. Photo: Ragnar Våga Pedersen. 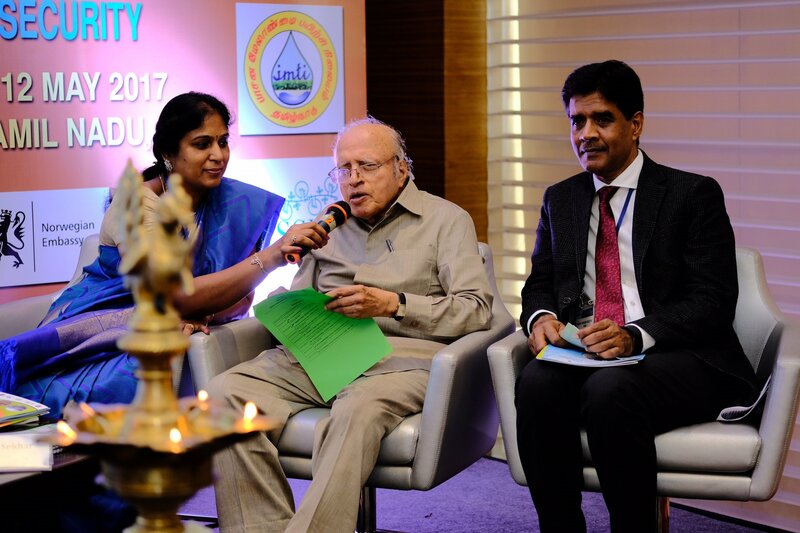 In 2015 Dr Swaminathan, also known as the Founding Father of India’s Green Revolution, said that the most important output of ClimaAdapt would be the development of new technologies, i.e. new seeds, new methods for water conservation and soil enhancement, as well as new methods for overcoming extreme fluctuations in temperature, sea level and floods. “The project will enhance the coping capacity of the Indian people and thereby enrich their food and livelihood security,” he said. Two years on, and this is certainly the case. By linking scientists, stakeholders and policy makers to work towards common goals throughout the project duration of five years, the outcomes have benefited close to 90,000 Indian small-scale farmers so far, and will continue to do so for years to come. 90,000 Indian smallholders now have access to extensive knowledge on how they can adapt their agricultural practise to a changing climate. This will hopefully ensure a food secure future for generations to come. Photo: Ragnar Våga Pedersen. Not only that, the project model is now being used in other projects as well, the most recent being EU-funded InnovAfrica which will work towards ensuring food security in Africa through smallholder adaptability. “I’m struck by the complexity of the program – the number of institutions and thematic areas – and the way they have kept it together in an impressive manner – keeping the focus. I have not seen anything like it. So it is a “well done project” from my side,” the representative from the Norwegian Agency for Development Cooperation, NORAD, recently wrote in her end review of ClimaAdapt. To help Indian farmers combat the challenges linked with climate change, it is critical to provide them with good and relevant information at the right time and develop climate-smart agriculture technologies. 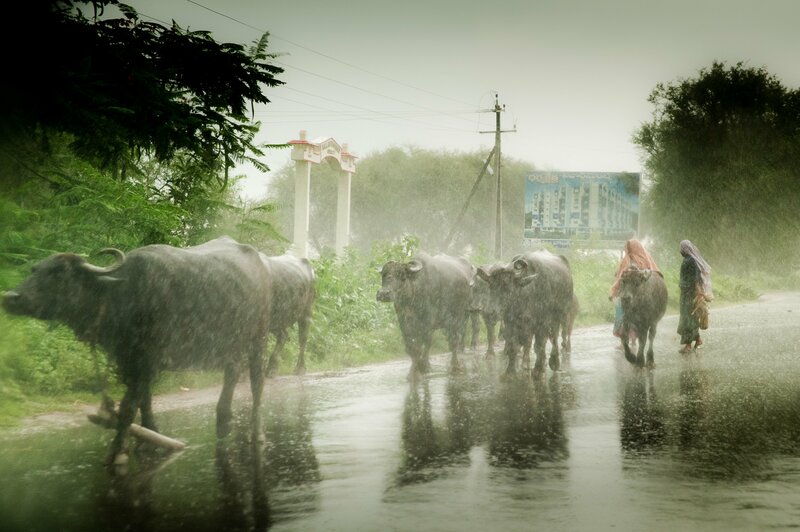 The primary objective of the ClimateAdapt project has been to improve the adaptive capacity of the farming communities and agriculture and water sectors in the three Indian provinces of Andhra Pradesh, Telangana and Tamil Nadu. This has been done through pilot testing of selected adaptation measures and developing methodologies for upscaling the tested measures, as well as capacity building of local stakeholders and agencies involved in climate change adaptation. The project was initiated in 2012 and had its final meeting in May 2017. Approximately 25-30 scientists with expertise in various disciplines including climate and hydrology modelling, agronomy, soil science, irrigation, pests and diseases, economics, policy and gender have been affiliated with the project. ClimaAdapt was funded by the Ministry of Foreign Affairs in Norway, through the Royal Norwegian Embassy, New Delhi. Project partners include the Norwegian Institute of Bioeconomy Research, NIBIO, the International Water Management Institute, the M.S. Swaminathan Research Foundation, the International Water Management Institute (IWMI), the Water and Land Management and Training Institute (WALAMTARI), Tamil Nadu Agricultural University (TNAU) and the Irrigation Management and Training Institute (IMTI). Norway’s Minister of Agriculture and Food, Jon Georg Dale, on ClimaAdapt. A video from NIBIO on Vimeo.